Guten Tag Turkey Pie Peeps. I am one of Jill's BFFs and a honored guest blogger. And man, do my boys and I LOVE to play. I've got Bookie who's 4 and 3/4ths and Smudge who's 1 and 1/2. And one of our favorite things to do it to pick a good book for inspiration and build play scenarios around it. Activity 1. Make paper boats of course! This was an easy starting activity seeing as the Curious George readers always have an idea or two in the back already thought out for you. 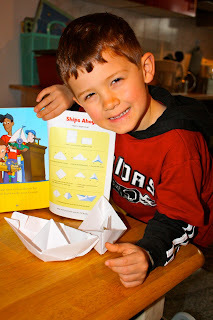 And folding is a great small motor skills activity for pre through grade schoolers. Activity 2. Use what you already have that goes along with the theme. You've got a treasure chest at home... use it! We made lots of Lego boats... you can use anything really. Activity 3. Pretend play fun! Find a boat (we have a rockin' park here) or make your own and set sail. We were on the run from pirates of course. Activity 4. Sail some boats of your own with some water table play. Don't have a water table... fill up any old thing. Activity 6. Pre-bed boat races. Take turns being the boat and the motor. Now have at it... and viel Spass! Gracias, mi amiga. No habla deutsch. ;-) Muy bueno!